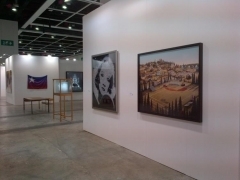 We will be returning to Hong Kong to participate in the fifth edition of the Hong Kong International Art Fair, ART HK 12, at the the Hong Kong Convention and Exhibition Centre from May 17 through May 20, 2012. 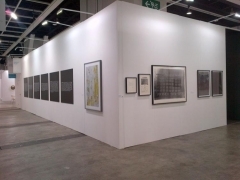 We look forward to welcoming you to our booth (3B09), on which we will highlight important works by a selection of the gallery's artists, underscoring our diverse and intellectually driven program. Our booth will feature a major solid-light installation by Anthony McCall. The work, Meeting You Halfway II, is a three-dimensional sculptural form made of light projected in a darkened, mist-filled room, and will be the first solid-light installation to be exhibited in Hong Kong. In addition to the installation, we will present a carefully curated, dynamic selection of works including a stunning new series of paintings by Terence Koh - ART HK 12 is one of the premiere occasions that the gallery has exhibited work by the ground-breaking contemporary artist - as well as a rarely seen editioned work documenting a seminal early performance piece by Tehching Hsieh and an important early work by Joseph Kosuth. 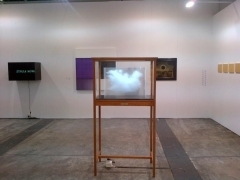 Other highlights include photographs by James Casebere and Frank Thiel, paintings by Laurent Grasso and Callum Innes, and Leandro Erlich's Single Cloud Vitrine (Hong Kong), one of a series of sculptural works which depict a 3-dimensional, diorama-like representation of a single cloud floating within a vitrine; each work in the series is titled for a different city around the globe in which the artist has exhibited. 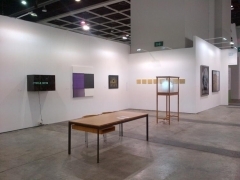 At ART HK 12, Joseph Kosuth will participate in the Intelligence Squared Asia debate at the Hong Kong Convention and Exhibition Centre on Friday May 18, 2012. 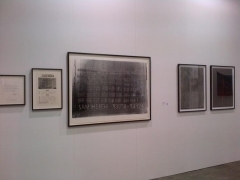 The debate, Contemporary Art Excludes the 99 Percent, will address the evolving dynamics of the world of contemporary art. Moderated by Hung Huang, the speakers will also include Ben Lewis Elizabeth Ann Macgregor, and Paul Chan. For more information on the event and to purchase tickets, please visit the Asia Art Archives website. 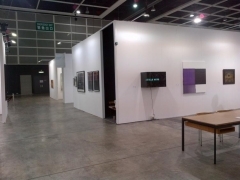 In Hong Kong during the fair, visitors will have an opportunity to see elements from another early work by Tehching Hsieh in a group exhibition at Para/Site Art Space, Taiping Tianguo, A History of Possible Encounters. 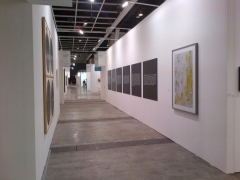 For more information on the exhibition, please visit the Para/Site Art Space website.